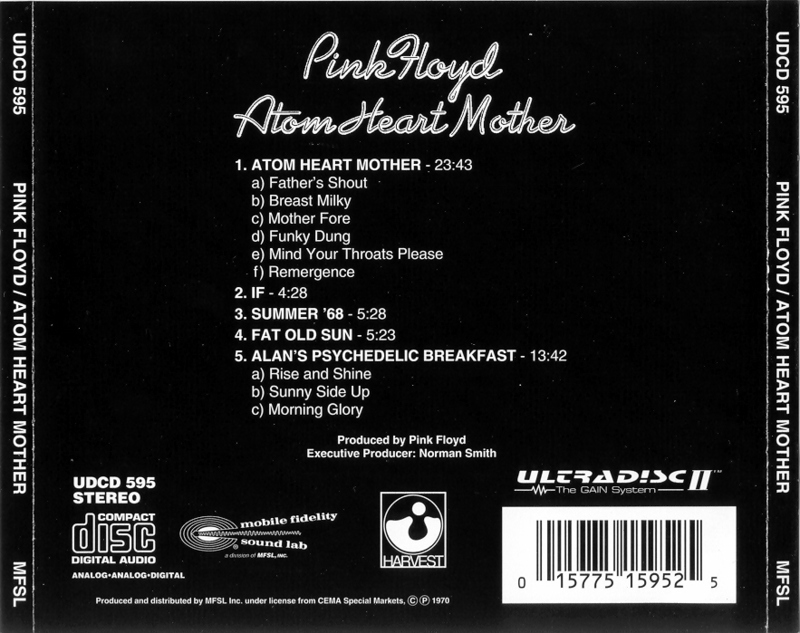 Atom Heart Mother is a 1970 progressive rock album by British band Pink Floyd. It is named after its title track, which was originally titled "The Amazing Pudding". The song's name was changed after the band came across a newspaper article about a pregnant woman with an atomic pacemaker with the headline "ATOM HEART MOTHER." The album was recorded at Abbey Road Studios, London, England. It reached number 1 in the UK and number 55 in the U.S. charts and went Gold in the U.S. in March of 1994. A re-mastered CD was released in 1994 in the UK and 1995 in the U.S. 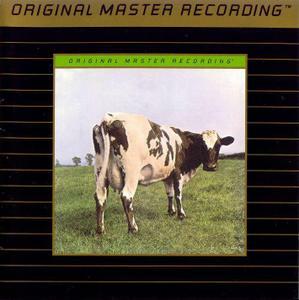 The original album cover shows a very ordinary cow standing in a very ordinary pasture, with no text nor any other clue as to what might be on the record. This is, in fact, due to the "space rock" imagery associated with Pink Floyd at the time of the album's release; the band wanted to explore all sorts of music without being limited to a particular image or style of performance. They thus requested that their new album have "something plain" on the cover, which ended up being the image of the cow. 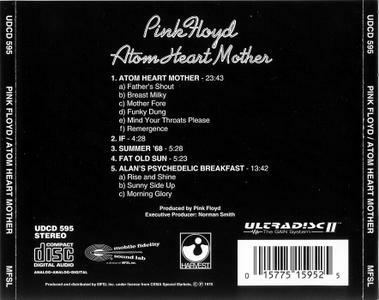 The longest two tracks are a progression from Pink Floyd's earlier instrumental pieces such as "A Saucerful of Secrets"; the Atom Heart Mother Suite is split into six parts and features a full orchestra while there are three distinct segments of Alan's Psychedelic Breakfast which are joined by dialogue and sound effects of a kitchen cooking breakfast. The reason the songs are split is because in the early 70's, bands only received royalties based on how many tracks were on an album. The original LP ends with the constant sound of a dripping tap in the inner groove. Also included are three five-minute songs: one by each of the band's three resident songwriters. Roger Waters contributes a folk ballad called "If" which he would play frequently at live shows in support of his Radio KAOS album. This is followed by Rick Wright's brass-heavy "Summer '68," a critique of the "rock 'n roll" lifestyle that would soon become characteristic of Pink Floyd. Finally, there is David Gilmour's "Fat Old Sun," which spent two years as a key part of the band's live set. David Gilmour - vocals, guitar, bass on "Fat Old Sun" and "Alan's Psychedelic Breakfast" (Morning glory), drums on "Fat Old Sun"
Richard Wright - vocals, keyboards, orchestration, bass on "If"
Nick Mason - drums, percussion, tape edits, tape collage, additional engineering on "Alan's Psychedelic Breakfast"
Ron Geesin - orchestration and co-composition on title track. Alan Stiles - voice on "Alan's Psychedelic Breakfast"
Again it is SHN. Do not add gap between tracks and you'll get a perfect copy. Just have a look at the time stamps of tracks, they are three years old.